Earlier this month The New York Times parenting blog ran a letter from a “Father in Florida” who has two young children but wishes he’d never had any. This is his gripe: “My life’s focus is now providing for my kids…and I have slowly accepted the fact that all those personal dreams are pushed to the side because of that.” The specific aspirations he’s given up include “working on my master’s degree with evening classes,” “Playing golf on Saturdays and lazy Sunday mornings,” and “personal projects, like the book I wanted to write, or starting a consulting business on the side, or training to run a marathon.” To top it all off, he’s had to move to the suburbs, which has installed a soul-destroying 45 minute driving commute into his morning routine. I admit, this letter got my blood up. Intellectually, of course, I understand that being a parenting is not for everyone and to each his own, etc. In my heart, though, I was less ambivalent. I find we react that way whenever anyone tells us they can’t stand something that’s important to us. If a friend were to tell me that he finds blogging as a genre to be tedious and self-involved, I’d understand his right to have an opinion, but of course I’d be a little defensive, too. Anyway, after I’d calmed down I had a few thoughts relating to this regretful dad and the impact becoming a parent has had on my own extra-family aspirations. The first, of course, is that the regretful dad clearly made a major miscalculation when he decided to have children, one that I think most people are able to avoid. He writes, “No matter how well prepared I thought I was, I was not prepared for the sheer magnitude of changes to my life.” It makes me wonder, though, how well had he really thought about the implications of fatherhood if he hadn’t realized that having two young kids was going to make it hard to play golf on the weekends? The fact that his cause-and-effect reasoning is weak also makes me question whether his two kids really are to blame for his unfulfilled ambitions to write a book, start a company, and run a marathon. If he didn’t realize that having kids means the end of “lazy Sundays,” I wonder if he understands that training for a marathon isn’t particularly compatible with lazy weekends, either. Life is full of frustrations and unrealized ambitions and it’s unfairly reductive to blame all of his “what ifs” on his kids. Plus, he’s only in his early-40s! There’s time to write that book just yet! My last point about the Florida Father is probably the least generous one of all. In general I try to be conservative about judging other people’s priorities. Who am I to have an opinion about what stirs your drink? Still, it’s hard not to conclude that his scale is off if it’s really super-duper important to him to be the “go-to guy at work, who can jump on a plane at a moment’s notice to go meet a client.” Isn’t it fair to roll an eye whenever anyone talks about being the “go-to-guy” for anything? The biggest reason that I took issue with the Floridian’s letter, though, is that it didn’t ring true in my own life. Having kids has actually made me significantly more productive. To continue on the marathon tip, every spring throughout my twenties I’d start to fantasize about running 26.2 miles in the fall. And every year the dream would die of laziness and self-doubt by Memorial Day. That is, until the spring of 2009 when Jay was born. When I became a father I thought to myself, “I need to become tougher and have endurance.” This thought sounds trite when it’s spelled out like that, but for the first year of Jay’s life it had a strong hold on the way I approached my days. I logged my training miles in the mornings, usually before Jay and Caroline were awake, and that November I ran the Philadelphia Marathon. I think it’s highly likely—maybe even certain—that had we forestalled childbearing a few more years I’d still be aspiring and failing to run that race. When I was in high school I remember a teacher telling me that he noticed his students tended to do better in class during the months of the school year when they were on a sports team. His theory was that the time demands of playing on a team meant that kids had to be organized about when they were going to get their homework done. He thought students actually did better under these conditions than when they were awash in free time. I find in most areas the same is true about having kids. When I do get a free hour I realize it might be the only free hour I get all day which makes me a lot less likely to fritter it away on some activity I don’t really care about. This is not to say, of course, that I don’t have some sympathy for the Florida Dad. The last two years are littered with things I wanted to do but couldn’t because we have kids. The day Wally was born I was scheduled to go with a friend to see “Tree of Life” and now I’ll have to wait for Netflix, if I ever see it at all. I’m not going to a good friend’s bachelor party this summer because it would take years off Caroline’s life to have to take care of Jay and Wally by herself all weekend. And we have friends who just came back from what sounded like a wonderful trip to Beijing. I listened to them tell about it and felt a pang when it occurred to me that it might be a decade before I travel any farther east than home to Maine. While it’s easy to make a list of the things I’ve missed out on because of Jay and Wally, it’s harder to quantify the ways in which they’ve made my life better. As a list of bullet points, going out to drinks with friends is obviously a lot more fun than pacing around our apartment trying to get Wally to fall asleep (as was the trade-off last night). But the main reason Caroline and I decided to have kids in the first place is that we wanted something more in our lives than a day-in-day-out perspective and in that view the calculation isn’t even close. 17 days of breathing air have enlivened Wally, but just a little. He was awake for about five hours yesterday and spent a lot of that time looking around and punching his arms and legs in the air. His hair is maybe a little more golden than it was when he was born, and he has developed an intoxicating scent in his soft, soft hair. He’s turned out to be quite a spitter-upper which has us running for towels several times a day. But beyond that he’s still very fetal. Last night he got worked up as I was changing his diaper. His quivering, red-faced cry sounded just the same as the one he’d made as he was rushed onto Caroline’s chest during his first minute of life. Earlier in the day yesterday I asked Caroline if she loved Wally yet. It’s a topic we’ve talked about a few times since he was born and the answer is still the same: Not quite yet. I feel a very deep sense of responsibility towards him and he captivates me, but I wouldn’t say I love Wally—at least not in the way I know I love Jay. Wally still seems strange and foreign, like a distant traveler come to take a rest in our bed. When Jay was first born I remember feeling the same sense of distance from him. Caroline and I would look at him lying in his bassinet and think “Where did he come from?” From the first day he felt like my responsibility, but it took a little while before he started to feel like my son. The other night Caroline and I had dinner with some friends who’ve been parents for a lot longer than we have. Like us, their feelings for their children had come about more through a process than a burst of light. After dinner we sat on their front stoop and ate ice cream and asked them how long it had taken them to fall in love with their children. The mom laughed and said that at birth her second daughter had skin so pale you could see her “blue veins” running across her body. She estimated it was “two or three months” before she’d fallen in love with her daughter completely. With Jay I was surprised I didn’t feel this instantaneous love. When Wally was born I was prepared for the fact that a relationship with a newborn child takes time to develop, just like any relationship does. But it’s strange to feel much closer to Jay than I do to Wally. I think of how many times growing up I heard my parents tell me and my three siblings that they loved us all equally. It seemed to me to be one of the great mysteries of parents that they could feel this tremendous emotion and feel it exactly equally for four different people. And I’m not quite there with my own two kids. At the same time, it is exciting to think about how much I love Jay and to know that before too long I’ll feel the same way about Wally. It’s not everyday that you get to fall in love like this again. On Friday night Caroline, Jay and I sat on our bed reading bedtime stories. This is a nightly routine for us. We put Jay in his pajamas, brush his teeth, and then plop him on the bed between us with a cup of milk and read from a pile of picture books. This particular night Caroline was reading Richard Scarry’s Cars and Trucks and Things that Go and Jay was being particularly sweet, pointing out his favorite trucks and kicking his feet excitedly when Caroline turned to the page with all the construction equipment. I was tired and feeling happy and I lay my head on Jay’s tiny shoulder. Jay didn’t like this at all. He pushed against my forehead with his little hand and said “No Daddy, go away.” I sat up, a bit chagrined. I love Jay more than I’ve ever loved anybody, and that love wants to express itself through affection. But I realized in that moment that while Jay can lay his head on my shoulder, it’s not my place to lay my head on his. A few weeks ago I wrote about a conversation I overheard between a mom and her college-aged son. It struck me, listening to the two of them talk for almost an hour, that there was an imbalance between them: the son gave the impression that he was indulging his mom with his company, while for her part it seemed that there was no one she would rather be spending time with. My mother-in-law emailed that essay to several of her friends with grown sons. One wrote back, “I think that love flows down, parent to child, in a way that it just can’t flow the other way.” I liked that, and I think it captures a little of why it felt unnatural for me to put my head on Jay’s shoulder. In every other loving relationship such a gesture would have fit: we rest our heads on the shoulders of our spouses, our friends, our siblings, our parents. But children recoil—almost instinctively—when their parents show signs of needing them emotionally. On Saturday morning I was talking about this with a friend—a man with two grown children of his own—who recommended I read Michel Montaigne’s essay “On the affection of fathers for their children.” That night I read it on the couch beside an open window with Wally asleep in my lap. Montaigne, I knew, is considered the “father of the essay,” and as I began to read I was amazed, first of all, at how current the writing seemed. I paused after a page and looked him up in Wikipedia, expecting to find that he’d written in the late-19th century or something like that—just long enough ago to give him stature, but recently enough that his sensibilities don’t seem radically different than our own. I was stunned to discover that he died in 1592. The world has turned over a few times at least between then and now, but not everything has changed, apparently, in how parents feel about their children. Anyone who does a kindness to another loves him more than he is loved in return; anyone to whom a debt is owed feels greater love than the one by whom the debt is owed; and every creator loves what he has made more than it would love him. In the years before Jay was born barely a day passed in which I didn’t experience a pang of longing for a lonely beach or a high mountain walk. That feeling went away when we had kids, both because I no longer had as much time to think about things like that and because life had become richer right where I was. When I walk home into our one bedroom apartment, the noise and activity of our family’s life together provides its own kind of retreat from the world. Still, I savor the moments of quiet when I get them. 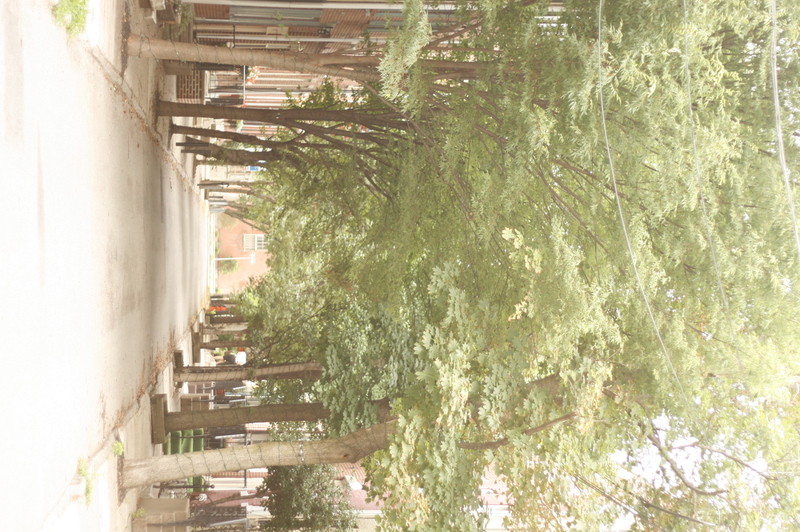 I walk Jay over to daycare every morning, and my route back home provides the chance to walk down a block of quiet Addison Street, where no cars pass and the trees form a tight canopy overhead. I make myself walk slowly down the block and I’m always slightly sad to leave it behind. Here’s a picture I took this morning. It won’t be long before Jay starts calling my name from his crib, but before he does I wanted to say a quick something about naming. Yesterday afternoon in the park a mother came up to me and Caroline, drawn by the sight of Wally’s not yet two-week-old feet dangling out of the Baby Bjorn. She asked us his name, and when we told her, she got excited and said that her favorite nephew is named Wally. Caroline and I smiled and pretended to be excited, too, but we weren’t thrilled. It’s delusional, of course, to think that our sweet little son would be the only Wally in the world, but still, it’s a delusion we would have been happy to maintain. Then the news got worse. The mom told us that when her nephew had entered kindergarten he’d been one of four Wally’s in his class. “But he lives in New York City,” she added, as if that would make it better. Next to me I could feel Caroline’s spirits plummet. We chose Wally after months of deliberation because we liked that it was neither entirely made up (most people, I think, have known a Wally or two) nor particularly popular. We thought it would help our son be traditional and distinctive at the same time. And now, maybe, it seems that we were not alone in that thought process. If Wally matriculates into kindergarten five years from now and finds the room so jammed with kids who share his name that he has to go by “Wally H.,” I’ll take it as more evidence of how embedded we all are in the same cultural trends. We have a friend who learned this lesson recently while the ink was still drying on his daughter’s birth certificate. He and his wife had named her “Ella” because they thought it was a beautiful name and because twenty-five years ago when they’d been in elementary school they hadn’t known a single one. So, they were more than a little crushed when Caroline called up the Social Security Administration rankings of the most popular baby names and showed them that Ella is now the #13 most popular girl’s name in America. In 1961 it was the #1 girl’s name but by 2009 it had fallen out of the top-100. Cohen found that Mary has been declining in popularity by about 8% a year and based on that he predicted there would be 2,848 Marys born in 2010. It turned out he was wrong. But only by 22! The actual number was 2,826. So, if Wally’s name won’t be what makes him distinctive, maybe we’ll have to start giving him inventive hair cuts. My first reaction: This is hardly a new story. 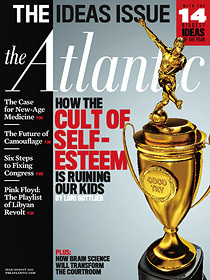 Gottlieb says that today’s parents are so obsessed with protecting their children’s self-esteem that they’ll do anything to prevent their egos from ever getting hurt. She cites a Washington, DC youth soccer league where even the clumsiest kids get trophies at the end of the season. I’m pretty sure my parents were making this exact same complaint twenty five years ago when I first started kicking a ball around. But beyond that, this should have been a story I liked. Caroline and I are not particularly coddling as parents. Jay doesn’t have a lot of toys. He’s never taken music or swim or yoga classes. When he bites his tongue and tears well in his eyes I sometimes remark, “Bummer. You should probably be more careful next time.” And in general I like rules and standards and I enjoy making Jay do things just because I say he has to. So, I should have been applauding as I read the article. But I wasn’t. For one, the anecdotes Gottlieb cites as evidence of this plague of “wussy” parenting don’t ring true—or at least they don’t seem representative of most parents I know. She tells one story, for example, about a mom who had a fit when her toddler son had a prized truck stolen away by another kid. She also calls out parents who, when their kids fall in the park, “swoop in immediately, pick up the toddler, and comfort her in that moment of shock, before she even starts crying” rather than letting their kids learn about pain and failure on their own. Over the last two years I’ve spend hundreds of hours (maybe even over a thousand) with Jay in parks and playgrounds around Center City Philadelphia. We live in just the kind of well-to-do urban neighborhood where the indulgent parenting Gottlieb talks of is supposed to be rampant but I haven’t seen it (at least not in epidemic proportions). Sure, there was one mom who told me as her daughter ripped a bubble wand away from Jay that “my daughter doesn’t share.” But far more typical is the dad who bends over backwards to make his toddler share. When two kids go after the same toy in the park it’s almost a contest between the parents to see whose child is capable of greater self-abnegation. My larger problem with Gottlieb’s article, however, is that it replaces one kind of parenting dogma with another. I agree with her that kids who aren’t given the room to experience disappointment and unhappiness as children will have a harder time dealing with those emotions when they confront them in adulthood. But in her mind the problem with that parenting approach is its content. In my mind it’s the attitude underlying it—that there is a certain, knowable, specific way to raise a child—and on that score Gottlieb is just as guilty as the parents she takes aim at. Throughout the article she approvingly quotes experts who say things like “A kid needs to feel normal anxiety to be resilient” and she writes herself, “Kids also need exposure to discomfort, failure, and struggle” (emphasis mine). Alarms go off whenever I see a parenting expert saying that kids need any one particular thing. Sure, kids need vegetables and they need a bedtime and they need to learn right from wrong. But what they need most of all are parents who recognize that there is no one surefire way to approach raising a child. To put this in concrete terms, when Jay skins his knee in the park what he needs from me in response varies from day to day. Some days he gets back up without a second thought. Some days he’s tired and fragile and needs a hug and a pat on the back. And other days he’s whiny or clingy and I decide to give him some space to figure out that dad can’t solve all his problems. The point is that apart from love, food, and sleep, kids don’t need any one thing all the time. I call this attitude “pragmatic parenting.” It recognizes that kids, parenting, and life in general are all extremely complicated and that in the face of such complexity a good dose of humility is in order. Who knows what alchemy of experiences produces a happy adult? The biggest problem with Gottlieb’s article is that she thinks she does.